The C value for Drosophila melanogaster is not only useful in its relationship to the net amount of genetic information embedded in its chromosomes (1,4,12), but it is also needed to study changes in DNA levels associated with alterations in the total amount of genetic coding potential following changes in cell size and cell functions during larval and adult life in this species and its congeners (18,28-31). Sequencing of the Drosophila genome (4) has now set the future course for the field of molecular developmental biology. Fig. 1. 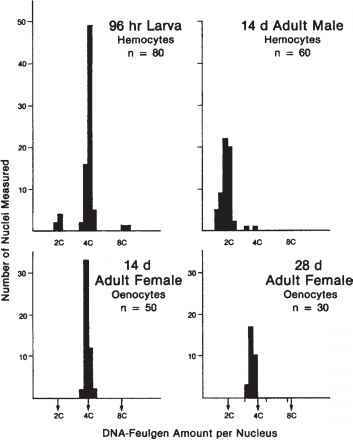 Histograms of Feulgen-DNA amounts per nucleus for larval and adult hemocytes and oenocytes of Drosophila melanogaster, expressed in arbitrary units of relative integrated absorbance, to estimate the extent of genome replication in different tissues at ongoing stages of development. 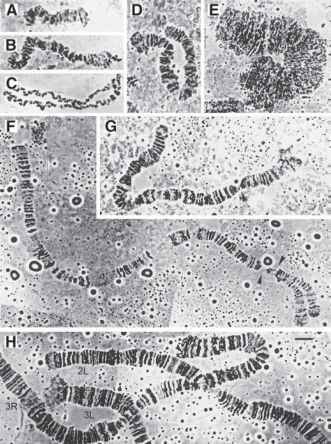 Note differences in frequencies of 2C and 4C hemocyte nuclei at the larval and adult stages. Oenocytes from adult females show only 4C nuclei, presumably holding at an arrested G2 stage of the cell cycle (Rasch, unpublished data). puted from the average DNA content determined for populations of 50-75 nuclei in fat body cells measured in adipose tissue at each different stage of development. The data on these changes in DNA levels shown represent more than 3000 scans of individual fat body nuclei and are based on measurements of chicken blood cell nuclei used as a reference standard of 2.5 pg DNA (2,12,16,31,34). Fig. 2. 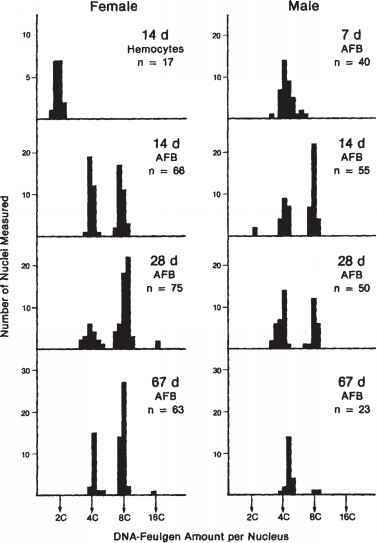 Histograms of nuclear DNA measurements of fat body nuclei from 14-d, 28-d, and 67-d adult females and males of Drosophila melanogaster. The C value for sperm (0.18 pg DNA) was used to identify a shift in nuclear DNA contents from 2C to 4C to 8C during senescence in both female and male adults. Fig. 3. Changes in average nuclear DNA content of adipose cells during larval development in Drosophila melanogaster. 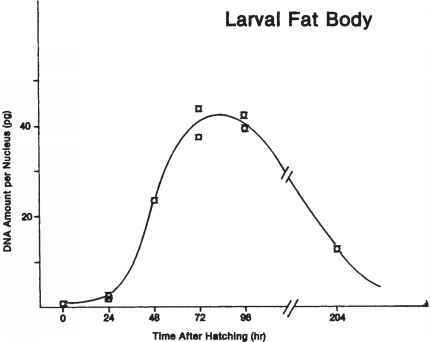 Some of the large, somewhat densely stained fat body nuclei approximate 128C and approach up to the 256C DNA levels, suggesting that at least six to seven or more cycles of endoreduplication occur during the course of fat body maturation and senescence (31,34). at present, but they do point out that additional critical studies are needed to account, at least in part, for apparent discrepancies between expected DNA levels from replication of the entire genome and the amount of DNA that is detected by DNA-Feulgen cytophotometry in polysomatic dipteran tissues (1,10,12,23-25,33,36). Perhaps the elegant studies of Gerbi and her co-workers (37) to identify precise sites of origins of DNA replication for the giant poly-tene chromosomes of Sciara coprophila have now opened the way to apply their strategies to the persistent problem of heterochromatin underreplication in Drosophila. Because manifestations of selective gene replication as well as differential gene activation and selective gene expression are of considerable interest to geneticists and developmental biologists, there is a pressing need to determine C values for a given species and to follow changes in the amounts of DNA per nucleus in particular types of tissue during differentiation. With the "return of the H-word (heterochromatin)," to quote Lohe and Hilliker (14), there is a growing interest in the potential role of highly repetitive and/or satellite DNAs and their associated proteins in molecular and cellular biology (15). In addition, comparisons of C values are of interest in phylogenetic studies of specia-tion and evolution in many groups of animals (1,10).